Barry was born March 8th, 1957. January 16th, 2004 Barry Flannery passed away in Canton, Georgia at the age of 46. 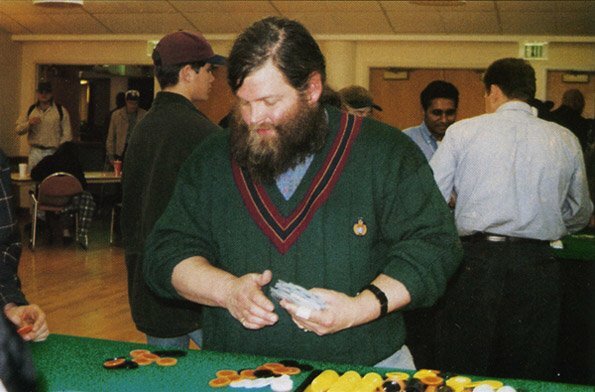 Barry is shown in this 1996 photo dealing blackjack, which he frequently volunteered to do, during Cab’s annual Casino Night. I first met Barry Flannery during my Freshman year at Marietta High School. He had skipped a grade or two and was a year younger. He spent his earlier years at St. Joseph Catholic school. Although his family wasn't Catholic, his parents were adamant about him having a better education than they felt could be had in public schools. Barry was very, very shy. At that time, it was considered "proper" to send your children to "Cotillion" at the Marietta Country Club so they could learn to be proper ladies and gentlemen. I think it may have cost his parents an enormous amount to send him, because as far as I knew, they were not Country Club members. He and I first met at a dance the Cotillion was having at the Atlanta Yacht Club. I believe that Ms. Elizabeth Clement (our dance teacher) must have been a member there. Ms. Clement lived on Moores Mill Road ( a very wealthy area at the time) in Atlanta. Somehow during this dance Ms. Clement noticed Barry was missing. After a search, we found that he'd gotten in a small sailboat and somehow gotten out into the lake. Ms. Clement was freaking out about something happening to "that dear sweet chid". Some other folks went out in a boat and brought Barry and his boat. Barry had no earthly idea how to sail! That is when I decided I should befriend him- he was a man after my own heart, an explorer and tinkerer! I teased him about being a "dear sweet child" often. I can remember even doing it the last time I saw him alive. Barry and began hanging out a lot together. We'd ride our bikes all over Marietta. He had a transistor radio that he would attach to his handlebars and we'd blast WFOM and then later WQXI-FM everywhere we went. Eventually I got my own bike radio that was made by Radio Shack. I remember it had an electronic horn but no one could hear it in front of me because the speaker faced towards the rider. 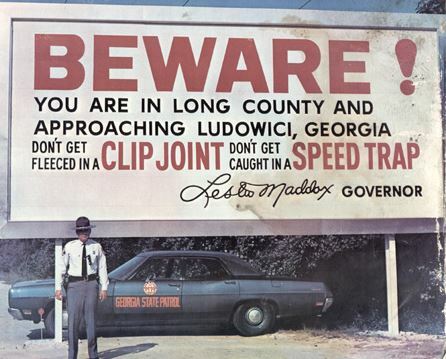 Some of the places we rode included Way out John Ward Road, Cheatham Hill Road, Kennesaw Mountain (and about what seemed like 60 MPH down it, and all over Dobbins AFB and Lockheed. We'd sneak in by riding (actually) down 100 really steep concrete stairs from a parking lot. The guard at the back gate near Atlanta Road and S Cobb Drive hated us because we always outsmarted him. We'd try to make up some story to get in and he would turn us away. Then we'd sneak down those stairs again and roam around, always properly exiting through his guard house. He chase after us saying "I told you monkeyheads to stay out from around here". Such fun, mischevious, boyhood times! Besides cycling, Barry was interested in radio, stereos, and especially photography. He always had a cool stereo and lots of LP albums. He spent lots of time in the Marietta High darkroom working on photos he would take for either out newspaper or our yearbook. I was interested in electronics. Some of our prowling about led us to the upstairs office of WBIE radio on Atlanta Street (over Western Union). We made friends with Jim Wilder, the owner and a very famous radio pioneer. Soon we met Don Hatcher ("the three headed man") and Phil Baker (Phil B and Company) and one of his personalities: Bridget the Midget. Phil would create bridget by recording audio at half speed and talking half as fast, then playing it back at normal speed. This gave a regular speed high pitched voice. Barry and I studied for and passed our Third Class Radiotelephone license exams down at the FCC in Atlanta. We were now equipped to operate station WBIE, which we were sometimes allowed to do (mostly just recording meter readings). After a while we grew bored and wanted our own radio station. We sent off for some 100 Milliwatt AM radio transmitter boards. We put one on his swing set in a Tupperware box and another one down the street on a neighbor's swing set and we connected these back to Barry's room with shielded audio cable. For power, we put a bunch of D cells or 9 volt batteries, I can't remember which. We discovered that by operating them at twice the rated voltage we could percieve a little better range. We could ride our bikes all the way to the Marietta square and still hear our signal. Our signal (which was now called WBKF and on 650 Kc AM). Yes, folks, we had a pirate radio station. We sat there after school and played records into those two little transmiters for all three of our listeners out in Radioland. Eventually we wanted to play cassette tapes and have live audio as well. For this, we needed a console or mixer board. I read some books and took some stuff apart and we went and asked our other friends at WBIE and came up with some ideas. We spent many afternoons and Saturdays tinkering with our soon-to-be radio console. Somewhere around this time, we also hung around WSTB, the unlicensed, low power station of Southern Tech (Now Southern Poly). Although they were supposed to be a 10 watt station, we were disappointed to find that they were only a carrier current station, broadcasting over the fire alarm wires in the dorms. "Not real radio!" we decided with a Harrrumph. I'll be writing/posting more "Barry Stories" over the next few weeks as I have time, so stay tuned. I have lots of them! 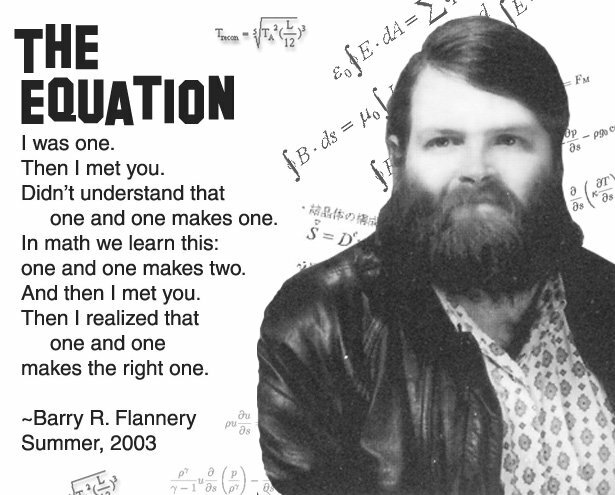 This article was originally written by Miranda Bennett of "The Sting"
The late Dr. Barry Flannery, associate professor in the Mathematics Department, was remembered fondly last Thursday. Family, friends, students, and colleagues gathered in the Library Rotunda for a memorial that inspired laughs, sobs, and moments of quiet contemplation. Dr. Flannery had passed away on January 16th following liver failure. A private family gathering was held that weekend, but no funeral, as the late Flannery had requested cremation. “I am so richly blessed by the presence of all or you here today and the expression of affection for a man I got to call beloved,” said Michele Flannery, Dr. Flannery’s widow. Mrs. Flannery shared stories of their life and love, poignant moments, unique memories. She told of a trip to the local animal shelter, where Dr. Flannery demanded to know which dog was next to be put to sleep. That day, Dr. Flannery adopted four dogs to add to the four dogs that already shared his home. She told of her continued desire to buy gifts for her late husband every time she goes shopping, admitting that during their marriage she fed his eccentricities. Director of Humanities and Technical Communications Dr. Mark Stevens gave Dr. Flannery credit for making him a better teacher, saying that the late professor had taught him the value of an open door policy with students. Dr. Jack Pace, an associate professor in the Mathematics Department recalled humorous dialogues with his late colleague. “We would talk about the strange behavior of our students and even stranger behavior of some administrators,” he said. Dean of Students Barry Birckhead recalled his and the late Dr. Flannery’s mutual enjoyment at yelling “Hey Barry,” to one another in passing. Birckhead noted the genuine interest for student needs that the late professor had evidenced throughout his service on the Student Life Committee. Former WGHR Manager Dustin Grau recalled his discovery that Dr. Flannery worked as a DJ at GA Tech and SPSU. Grau reminisced about Flannery’s joking nature coming through on his show, Professor Guy. 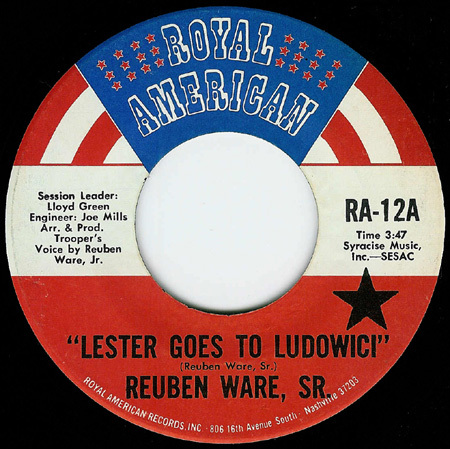 “He always seemed to enjoy himself at WGHR—it was his ‘excuse to keep his music collection organized,’” said Grau. Speakers and comments were abundant- colleagues, students, neighbors, even a student from Reinhart College attended the memorial to depict Flannery’s impact as an adjunct professor. Fowler even read student comments from teacher evaluations that spoke to the professor’s dedication to student learning. “I waited 45 years to find the right man…then I met this incredible human being….Barry became my best friend, my favorite companion, my lover, my husband, my teacher…” Michele Flannery asserted in closing to a captivated audience. A course may pass away with the late Dr. Flannery – Society and Statistics. According to Associate Professor Julie Newell, Dr. Flannery had initiated the class and offered it every summer. Dr. Barry Flannery, a native of Cobb County, came to SPSU in the fall of 1991. He taught Probability and Statistics, Calculus, Trigonometry, Algebra, and Statistics and Society. In addition to his teaching duties, he served as the faculty advisor for WGHR and acted as a DJ for the station. He volunteered yearly as a dealer during Cab Casino Night, and worked the concession stand at Hornet Games. According to Director Fowler, Flannery worked on the faculty development program at GA Tech during the 1999/2000 academic year. Dr. Flannery earned his Bachelors of Science in Mathematics from Georgia State University in 1977. He earned his Masters in Statistics from UC Berkley in 1981, where he went on to earn his Ph.D. in Statistics in 1986. Michele Flannery asked that donations be made to the Bartow County Animal Shelter in lieu of flowers. Bartow County Animal Shelter is located at 1410 Burnt Hickory Rd SW, Cartersville, GA 30120. The shelter’s phone number is 770-387-5153 and their contact email is gentryt@bartowga.org. According to Fowler, the Dr. Barry Flannery Memorial Fund has been established by the Foundation. For more information about the fund, such as how to contribute, contact Ann Watson, director of Marketing & Public Relations at 770-528-7340 or at awatson@spsu.edu. Dr. Barry Richard Flannery, age 46, of Canton, GA, died Jan. 16, 2004. He is survived by his wife, Michelle Wright Flannery, formerly of Hampstead, NC, and her parents, Kathleen and Gentry Wright of Hampstead. Memorial services will be held on Thursday, Jan. 29, 2004, at 3:00 p.m. from the Library Rotunda at Southern Poly Technical Institute where he was professor of Mathematics and Statistics for 12 years. Dr. Flannery enjoyed music and rescuing animals in distress during his spare time. The family requests that in lieu of flowers, donations be made to Bartow County Humane Society, Cartersville, GA 30120. Huey Funeral Home, Canton, GA.